If you have teenagers in your family, chances are you’ve taken, or thought about taking, a college tour road trip. We just returned from our first tour of multiple college campuses with our teen son, and learned quite a few things in the process. Here’s some quick tips to keep in mind as you plan your own college tour road trip itinerary this spring or summer. Obviously, the first step in planning any road trip is deciding where to go! Families can’t hope to tour all college campuses that may be a fit for their teen, but they can certainly visit all of them in a given region. For our college tour road trip, we focused on Oregon schools my teen was interested in, since we live in Oregon and had only a few days for our road trip. We drove across the state, stopping at a few schools en route to our primary destination, Portland (where many schools are located). Later, we’ll do another college tour road trip further afield, heading to campuses across the western US during a longer vacation. Directly from university websites, it’s easy to book a campus tour online. You can do so as late as a week in advance in some cases, but I advise planning earlier. Why? 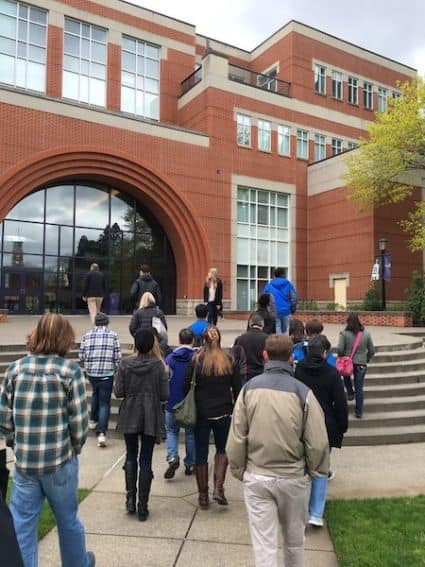 Campus tours fill up fast, especially during high school breaks, such as Spring Break. It’s also helpful to look to see if the college is planning anything special, such as full day visits or overnights (usually only for seniors). It’s good to take advantage of these, since more school personnel will be on-hand and special presentations may be planned. Try to limit your road trip itinerary to 1-2 schools per day. Once you’re ready to officially tour colleges with your junior or senior, be sure to visit a variety of different types of schools. On our college tour road trip, we visited four schools. One was a state school, the other three private. Two were in urban areas, two in rural areas. Two were quite large (over 20,000 students), and two were small (under 3,000 students). The ability to compare them all really helped my son see what was out there. The tours of schools that were in session during our road trip were definitely more insightful than the tours of schools on break. We got to see students interacting, going to classes, and living in their dorms at the schools in session. During our day at one Portland university, we had a great meal in the campus student center, met with a professor, and toured four different dorms, with students as our guides. At the other schools, we simply had to imagine the student body ‘atmosphere.’ Of course, sometimes it’s unavoidable to visit during quieter time periods, such as summer break. Remember that many state (public) schools have excellent programs, but you may have to look a little harder to find them. 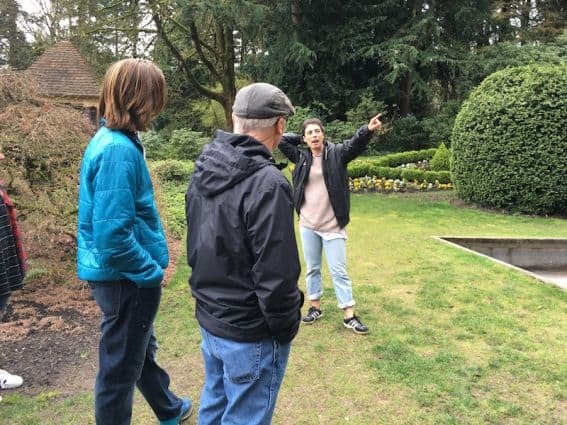 If your teen has a particular interest or major in mind, ask when you book a college tour whether you can also get a specialty tour tacked on. For example, when we visited a large public school, we booked a second, shorter tour specifically with the science departments. You can ask for specialty tours of campus Honors Programs, music programs, or even sports programs. Do you want to play basketball while there? Meet with the coach. Thinking of joining a specific club you’ve heard about? Ask if someone might be available to answer your questions. This advice works well at all schools, but is particularly important at public universities. Depending on your teen, he or she may be beyond excited to visit schools, terrified, or ambivalent. Get him or her involved in the process. We like to use Big Future on CollegeBoard.com to browse college options, make lists, and compare. Our teen input information (such as preferred college type, location preferences, and academic interests) and ended up with a list of ‘matches.’ He could then compare colleges on his list to see student body size, majors offered, and lots of other data. We made sure we toured all the schools on his list that were in the region we were road tripping to. If you’re seeing multiple schools (sometimes more than one per day), you definitely need accommodations where you can chill out in the evenings. We found a centrally located hotel, Holiday Inn Express Portland Airport, that offered what we needed most: free parking, breakfast, and WiFi, a hot tub, and even an evening reception with free snacks. It was comfortable and convenient, plus we gained IHG points, which we’ll use on our next family vacation. Next time you’re on a family vacation, do some research to see what colleges and universities are nearby your destination. It can be fun to unofficially tour a campus, even if you don’t think your teen will be seriously interested in attending. We visit colleges all over the US, and find it informative to see what urban, rural, and suburban campuses look like in different areas.